This recipe is one of my Spring favorites! I could easily be a herbivore. I love the pungent fresh flavors this appetizer offers. 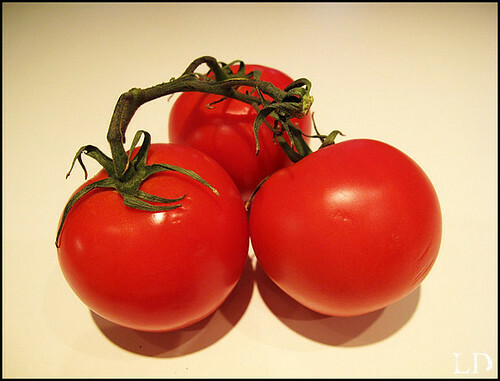 The smell of ripe tomatoes is the best, I wish I could bottle this divine smell. 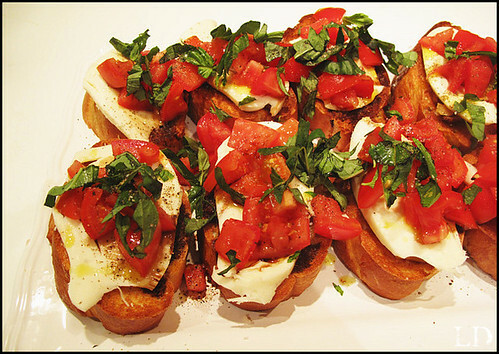 I often serve bruschetta for a light dinner, along side a good red wine, a perfect combonation. Roast your garlic, set aside to cool. •Roasted Garlic Recipe• Slice your french bread into thick slices and place on cookie sheet. Place in oven on broil and brown both sides of your bread. Be careful your bread will burn quickly on broil. Take you bread out of the oven and set aside. Chop your tomatoes, basil, and slice your cheese. On a big platter assemble your bread slices in one single layer. Once your roasted garlic has cooled take all the caramelized cloves out of the garlic paper. Lightly smear the roasted garlic gloves onto the toasted bread without crushing your bread. Lay a slice of cheese over each slice of bread. Top with your tomatoes and fresh basil. Drizzle generously with olive oil and balsamic vinegar. Season with salt and pepper.